It's all about NATO and the plan for Afghanistan on Monday. 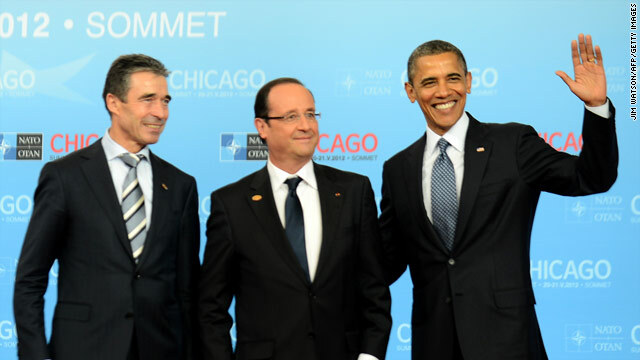 President Obama continues to host the NATO Summit in his hometown of Chicago. This morning he'll meet with the International Security Assistance Force to talk about the end game strategy in Afghanistan by the end of 2014. They'll also do the usual family photo but the highlight from the events in NATO today will be when President Obama holds a press conference this afternoon at the conclusion of the summit. Also, he'll make a quick trip to Joplin, Missouri tonight to deliver the commencement speech for the graduation for Joplin High School. Last year, almost exactly to the day, a massive tornado wiped out the high school and much of the town. President Obama will deliver remarks about 9:15p tonight before returning to DC late tonight (technically on Tuesday). Click below on the full schedule released by the White House. Anti Bain is anti-America and anti the American way. Who's an idiot? Raise your hand. The last two presidents who either had a degree in business, or claimed business experience were: George W. Bush MBA Harvard, and Herbert Hoover who owned a mining consulting business….what can I say other than that alone says volumes. Venture capitalist are only interested in the business of dismantling or bankrupting companies to make profit for their investors...isn’t Romney a little late George Bush already did that? Government is a way for people to work together to meet the needs of everyone...not just to enrich a privileged few. That is basically what the OWS movement is stating. Factually a person with community organizational experience is better equipped for the job. oh Jean...there you go again. MA was rated 50th in unemployment(out of 51 (for you libs)) when Mitt took office...and 12th place when he left office. This was because the state was attracting hundreds of new companies (jobs)...He lowered taxes while other states were increasing them. I guess you could say obama: " huh?" in his last job...was not attending to his job (many absences) and he did what as a private citizen....and he lectured law students..while as president his legislation is failing in the courts...a hummmm. Business experience...forgot many Presidents...Lincoln, Grant,Truman, johnson, literally all of the first several were business people..and they used this in campaigning. They had to have a job then...not like obama and drink off the breast of the taxpayer all of his adult life...in one form or another. You obviously know nothing about what you post...per usual. I can only say be careful of what you wish for...we could wind up with medicare for all....single payer. So to say the federal government can't mandate a person purchase health insurance is ridiculous we already are through payroll taxes. I have a feeling you are a free rider..that is the reason for all your whining. I actually don't see where running a business would be helpful when governance is not a business...so a candidate putting oneself forward as a business expert, and having failed like Bush and Romney at governance, that should raise red flags. Now chairing a non-profit organization that is experience. Selling a book you have written to a publisher... now that is not only hard work, requires attention to detail, and takes business expertise. President Obama has written six books, and obviously has been good enough at the job to find a publisher for all six. Of Thee I Sing – 2010...100% of profits goes to Fisher House to help families of disabled vets. That is not exactly drinking off the breast of taxpayers. Perhaps the president may want to schedule some time to remake the soon to be failed ObamaCare.